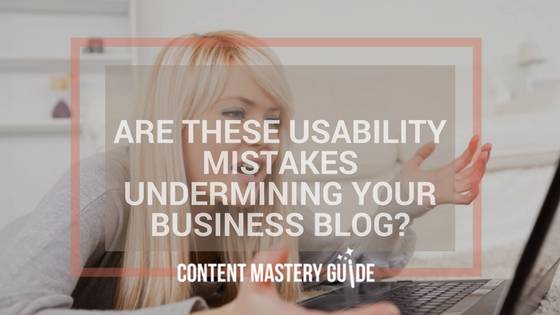 Are These Usability Mistakes Undermining Your Business Blog? Is your blog confusing your readers and sending them away dissatisfied? Tema Frank, author of PeopleShock: The Path to Profits When Customers Rule, and Chief Instigator at Frank Reactions, walks us through the topic of usability, and how it impacts business bloggers. Tema Frank is a marketing and customer service expert who built her first website in 1995 and has been helping businesses with online marketing since the late 1990s. Through her speaking, consulting and bi-weekly podcast, Frank Reactions on Customer Experience, she helps companies profit from the Internet. I met Tema online when we both tweeted that we’d be attending a Toronto marketing conference. By the time we met in person, I’d visited her website, listened to her original podcast series (the Frank Online Marketing Show), and discovered just how knowledgeable she is about online marketing! I’m thrilled she agreed to an interview, and I hope there will be more to come. Tema, one of the services your company offers is usability testing. I’d like to delve into the topic of usability and how it relates to business blogging. First of all, what is usability? Put simply, usability is about making a website (or software program, or anything else used by people) easy to use. What are some of the consequences of usability problems on your website? Wasted advertising and promotional efforts because people who come to your site can’t do what they want or find what they are looking for. Bad publicity (thus turning off future clients as well as those who hit the problem). People who have a bad experience on a website are likely to tell many others about it. Now with social media, that bad experience can quickly become known by thousands of people and hurt your business for years to come. Lost sales. Odds are there is someone else offering something similar that has a more usable website. Guess where your prospects will go? Higher customer service costs. If frustrated visitors can’t find what they need or do what they want easily, they’ll either give up or call you. Generally a call from a customer costs many times more than letting them do things themselves online. Increased costs correcting errors. If it isn’t clear how to do something, users will make mistakes. Those mistakes will cost you money as you try to untangle the mess they’ve made. What are some usability issues that are specific to blogs? One that drives me crazy is when there are no dates on the posts. Information, especially when it comes to technology, gets outdated quickly. If I don’t know when the post was made, how can I tell if it is still relevant? When my daughter was in her first year of university, I taught her that if she was short on time she should read the first and last paragraph of each chapter, then scan the headings and bullet points. That’s what people tend to do on blog posts too. (Though they probably don’t bother with the last paragraph). Too much text. Along with keeping your text scannable with sub-headings and lists, photos help break up the text on a page and add more visual interest. People are naturally drawn to images, especially photos with faces in them. Use a good headline under the photo, as that is very likely to be read. Are any of these usability mistakes showing up on your blog? Stay tuned for the next part of my interview with Tema Frank, where she’ll reveal her best usability tips for business bloggers.